I have been fairly vocal about the dearth of fine dining establishments around the Alamosa area. I think the best overall meal we've had here in the Valley was at the Creede Hotel. Because of this, I am always on the look out for that one place to single handedly turn my attitude around- knock me off my culinary feet, as it were. I haven't found it yet. I had high hopes for Chalet-Swiss, but it just didn't hit the mark. Here is the one thing I'll cut them some slack for- it was 11:30am on a Sunday. Maybe you have the B team on duty then and they are hung over. I don't know. We arrived at the Chalet-Swiss after taking a drive to look at fall foliage. As we passed by, I saw it was open and suggested we stop there for lunch. A good friend of mine had suggested it highly, so I figured we were in good hands. We walked into the foyer/reception area (which was devoid of human life) and stood there. And stood there. And stood there. We peeked through the glass doors and saw people eating, so we knew there was someone on duty SOMEWHERE. Finally, we walked through the doors and proceded to choose a table by the window. At that point, a very staunch looking woman (I'll call her Heidi because that's the most Swiss sounding name I can think of, and she never bothered to introduce herself to us)came from the back and informed us we could have a table for two (none available near a window). I looked around and noticed there were around 12 table tops and 2 other tables were occupied. Would it have killed her to let us have a table by the window? I think not. Heidi never cracked a smile. She handed us menus and took our drink orders and disappeared again into the kitchen. Dev ordered the veal bratwurst and I ordered the rosti of the day. 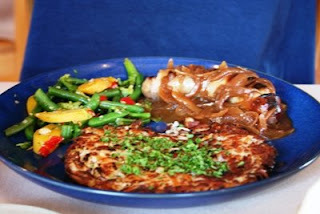 A rosti is very similar to a tricked out potato pancake. I had never actually had one, and was very excited to finally get my chance. Heidi came back with our drinks and a basket of bread. Nice looking, huh? It was pretty good. The butter wasn't room temp, which really bothers me in restaurants, cuz how hard is it to let it sit out for a little while to soften up? I mean, why should I have to fight with it and tear my pretty little piece of bread? I guess that's picky, but that's how I feel about that. A while later, Heidi brought us our food. Now- let me say the food was REALLY GOOD. Dev's bratwurst was perfect. It was seasoned well and cooked just right. My rosti was delicious! 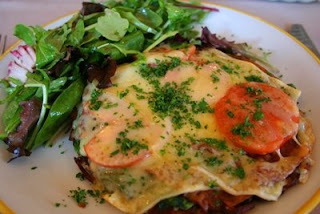 It was a thick potato pancake, smothered with sauteed spinach, sliced tomatoes, slices of bacon and melted emmethaler(sp) cheese. Heidi came back and forth, filling water glasses, still without smiling, and finally brought us our check. Would I go there again? Probably. I wouldn't mind trying dinner because they had fondue listed on the dinner menu and I LOVES me some fondue. I would do it in spite of the service, however. It's not that Heidi was a bad waitress. She was just completely un-personable. Chalet-Swiss is not a cheap restaurant. Atmosphere and service should be impeccable in a relatively expensive restaurant. Like I said at the beginning, maybe she was hung over. 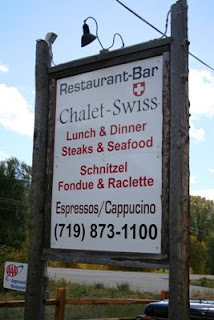 But if you go eat at Chalet-Swiss, please don't go on Sunday morning!